If you are short of time, the answers to the following 3 questions should let you know all you need to about the Pro 5000. If we have missed something, let us know in the comments. If you want more detail, you can read our full Oral-B Pro 5000 review further down the page or watch our video review. Nope! Nothing wrong with this brush at all. In fact, pretty much everything is right. Offering a decent battery life, multiple cleaning modes, a timer, pressure sensor and travel case, what is not to like? Bluetooth connectivity ensures it is future proofed and as such the 5000 scores a 4/5 rating! In our opinion, thanks to some revisions to the Oral-B range, it is the Pro 6000 that you should pay most attention to as an alternative. For the most part it is the same as the 5000 with a neater design, improved battery life and a bit more cutting edge. The Genius Pro 8000 is also worth consideration, but it comes in at a price premium due to the added features and box contents it offers. 3. Where is the best place to buy the Oral-B Pro 5000? With so many different retailers stocking this brush, there is no one best place to buy it from. We’ve included a live comparison of US retailers below, and it’s always worth checking out eBay. The Pro 5000 is also known as the SmartSeries 5000, because it was one of the first electric toothbrushes to have Bluetooth, therefore making it ‘smart’. So throughout the review I will use the name Pro and SmartSeries interchangeably. Oral-B officially name it Pro 5000, but the retail box has SmartSeries 5000 all over it! A little chunkier than some models it offers more cleaning modes and a fairly decent battery life, although since launch Oral-B have brought out newer models which in essence supersede this one. But, it is still available to buy and a lot of the time is the most cost effective option when you weigh up the pros and cons of each. What are the good and bad bits about this mid range toothbrush? 5 cleaning modes – Lots of cleaning modes to suit different users. From the conventional daily clean mode through to more advanced modes like deep clean and whitening. Storage compartment – Holding up to 4 brush heads the storage compartment is useful for keeping different heads separated and protected. Timed clean – An audible and visual warning when to change quadrant and when the 2 minute cycle is complete. Battery life – 10 days of battery life makes this one of the longest battery lives from the Oral-B range of electric toothbrushes. Pressure sensor – Get alerted when you are brushing too hard. The warning light makes it clear you need to reduce that pressure and encourages a better clean. Bluetooth – Connect to your smartphone and see in real time how well you are doing, what you can do better and achieve goals. Battery life – Up to 10 days life or 40 minutes of usage time is weak in comparison to a Philips Sonicare brush range that can offer as much as 3 weeks! Brush heads – A lack of brush heads given the variety of cleaning modes and provided storage compartment. Bluetooth – Clever, but some will find it hard work or a gimmick to use. The Pro name is a shortening of Professional which is used in part of the Oral-B marketing to represent a professional care range of brushes. There is no denying that the 5000 brings professional facilities to you and I as consumers and everyday users; but the recently attributed SmartSeries is too a fitting name given that there brush has Bluetooth connectivity and allows us to be smarter about our oral health care. 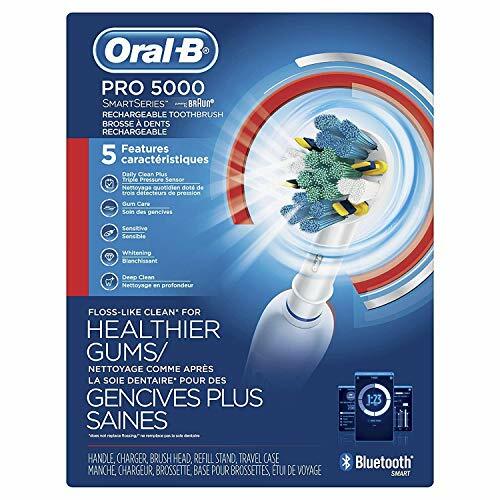 Download the Oral-B app to your Android or iOS smartphone and connect it to the Pro 5000 to be transported into a world of oral health care like you have never seen before. The brush handle connects to your phone in the same way a set of Bluetooth headphones or a speaker might. It is relatively easy and hassle free. Once connected the ability to store and share more data allows you to essentially build a cleaning history and diary of performance and the app can work as a coach. You can have the brush programmed to offer selected cleaning modes and have the app prompt you for flossing and rinsing your mouth with mouthwash and more. The Genius Pro does offer a few extra tracking features and customisations, as does the Pro 6000 and 7500, all of which are slightly newer models. If you are like me, you might take awhile to get in the habit of taking your smartphone in the bathroom with you. The good news is, that whilst you will miss out on the ‘live’ tracking, you do not have to have your phone with you every time to retain the data. The brush itself can store the data for up to 20 cleans and the next time it connects to your phone it updates the app and the history it has stored. Whilst a toothbrush plays a vital role in oral hygiene, the routine and way in which you clean does too. This app makes it easy to see and represent in real time just how good, or bad you are doing. This is particularly noticeable if this is the first time you are using an electric toothbrush, because you need to adapt your technique. Education is the aim of the connectivity and not to criticise you and the way you brush. The more you can take from the app to achieve your healthcare goals hopefully the better your teeth will be and the lower your dental bills. Bluetooth connectivity will not be for all and there is no denying you need to train yourself to use the app initially, as for many the concept is a little alien, when you have spent years with a less intelligent toothbrush. To help encourage further the inclusion of a smartphone stand would have been a nice touch. The stand could hold the phone at the perfect angle to view it in real time. In the current setup you need to hold the phone or place it on a countertop. A skinny brush this is not, it is both thicker and heavier than many other models, but that is the trade off for features and battery life. It is not huge nor cumbersome to use in hand but thicker profile is noticeable if you are more familiar with the thinner handles. About a 1cm thicker in hand and about 35g heavier at 168g with the head attached compared to the likes of the Pro 1 and 3000. The brush does look a bit clinical with a virtually all White colour scheme. The Blue light emitted from the LED’s breaks this up a bit. A White rubber grip adorns the handle with the back being more textured and grippy to the touch. Unlike plastic bodied brushes this make the brush much more comfortable in hand and easier to hold onto, especially when wet. On the front are 2 separate buttons, the power and cleaning mode button. These are located in the upper half of the brush handle. In the lower half is a silver backed panel which has the icons for the Bluetooth connectivity and, the battery status bars, as well as the brand logos. On the bottom of the brush is the recess into which the charging stand fits when the brush is docked. Off the dock, the brush does stand upright on a countertop. On the rear neck of the brush just before getting to the interchangeable heads is a smoked grey panel which sweeps down into the boy of the brush to join up with the two blue LED light strips that run the length of the body. This is the panel that illuminates Red if ever too much pressure is applied during brushing. This is the pressure sensor. Brushing too hard can be damaging to the gums in particular, so it is important to ease off as soon as possible. Whilst it illuminates a Red which is quite visible to you as the user you will hear the sound of the motor change too. If using the Oral B app, the timer will change to a Red colour and tell you too much pressure is being used. The motor will also slow down to avoid doing damage. As soon as the pressure is reduced, the light will go out, the motor will speed back up and normality will be restored. At the end of the day, the job of this brush is to clean your teeth and that is a job it does do very well. Depending on what report report you read will depend on what statistic you see, but generally speaking the consistent power delivery and approach used when cleaning your teeth with an electric toothbrush will result in at least a 100% improvement in plaque removal. The cleaning modes and engineered brush heads are particularly good at removing the bacteria buildup that often finds itself building up along the gum line. In fact, you might be pleased to read that the Pro 5000 is an American Dental Association (ADA) approved electric toothbrush. To gain the ADA’s seal of approval the brush itself has been thoroughly tested and has had to pass strict lab tests set by the ADA and meet the American National Standards Institute-approved dental standards. An electric toothbrush with such credentials has been proven safe and have shown efficacy in removing plaque and helping to prevent and reduce gingivitis, when used as directed. If you want to read or know more, consult the ADA Seal report for Oral-B electric toothbrushes. The brush heads provided with the Pro 5000 use an oscillating rotating and pulsating motion as shown in the following animated image. In the box you get just 1 x FlossAction brush head, which is disappointing given the price and the fact that also included is a brush head storage compartment that can store up to 4. Now you can buy any of the range of brush heads separately, but given the 5000 offers multiple cleaning modes, where certain heads work best, it’s a shame. The brush head options you have are CrossAction, FlossAction, Sensitive, Pro White, Precision Clean and Deep Sweep. There is too the more specialised Ortho brush head pack. All heads are interchangeable pushing on and pulling off of the brush handle. Any head can be used on any cleaning mode, but the Pro White head is best suited to the whitening mode. Remember that you should always change the brush head every 3 months or sooner for the optimum performance and to avoid damage to your teeth and health. Oral B’s very own brush heads use a dye on the Blue coloured bristles that fades in time. This acts as an indicator to you that you need to change your brush head. So if bristles that were once Blue are now White/Clear, get a new brush head. Daily Clean is the go to mode if you like, the one found on all Oral-B brushes. If you would like to know about any of them in more detail, see our post on Oral-B cleaning modes. You can choose any cleaning mode you like based on your preference. Press the power button once to turn the brush on, then press the function/cleaning mode button underneath to cycle through the cleaning modes. Press and hold the power button to turn it off. Frustratingly you need to remember the order. There are no icons or anything to show you which mode is activated. So to get to the Sensitive mode, you need to power the brush on, and press the function button twice. A standard brushing cycle is for 2 minutes, but cleaning modes such as Whitening and Deep Clean will go on for longer. During the normal cleaning cycle (Daily Clean) the brush will provide an audible warning via a slight pause in the brushing at 30 second intervals to tell you to change quadrant. This is your built in timer/quadpacer. The pause at the end of the 2 minutes is a little longer, in fact you get 3 brief pauses to alert you that the recommended 2 minute clean is over. The brush offers up to 40 minutes of usage time which on average equates to 10 days between charges. If using the Deep Clean mode, the number of days will be reduced. When the brush requires a charge the battery icon will flash red, but you may want to top it up before it gets this low. What is nice is that although not precise the 3 stage battery icon gives a good guide to how much is left before and after use. There is no denying my teeth always feel cleaner with an electric toothbrush clean than that of a manual brush. For some, particularly if this is your first electric toothbrush using the Sensitive cleaning mode and sensitive brush head for a few weeks would be good to ease you into the power and experience of using such a brush. The aforementioned brush head storage compartment is included with the SmartSeries 5000 as is a charging stand. The moulded piece of plastic complete with a lid which offers a home to additional brush heads. This protects them from dirt and dust and gives a safe place to keep them. Ideal if you use different brush heads or have brush heads for different users. Essentially a neat countertop storage and charging solution. Of particular interest to those who travel is the included case for the 5000. Basic but functional it holds up to 2 brush heads and the 5000 brush handle. Sadly you can’t charge the brush in the case like you can with the Genius Pro 8000 travel case. The brush is designed to be water resistant, all the internals are sealed inside the handle and should not fail as a result of exposure to water, toothpaste and saliva. Whilst safe to use in the shower my recommendation is to avoid prolonged exposure to water and do not leave the brush sat in any water or do not submerge it if possible. For peace of mind the 5000 comes with a 2 year warranty, but this does not cover user damage. Boasting 10 days of battery life, the Pro 5000 is certainly more capable than some of the cheaper alternatives available on the market today. However it is to beaten by some other other brands, notably Sonicare. The Genius Pro 8000 offers up to 12 days. If you want more than 12 days battery life you need to look elsewhere. If you travel frequently and this is why you need more power then consider the Genius Pro 8000 that allows the brush to be charged in the case. It is by no means a major issue, but one that some are particular about and that is, the SmartSeries 5000 has a Nickel Metal Hydride (NiMH) battery as opposed to the newer and more trusted Lithium-Ion battery. This battery technology is found in the Genius Pro. NiMH have a tendency over time to degrade with repeated charges. This is an issue that does not really affect Lithium batteries in the same way. To prolong the life of any brush do try to discharge the battery fully every 6 months and then recharge it fully. Naturally a charging dock is included in the box. This can stand on its own, or you can fit it into that space within the brush head tray. An all white charging dock, there is a small prong that sits proud of the surface and fits into a recess in the bottom of the Pro 5000. With one user, brushing twice a day for the recommended 2 minutes the 5000 will give 20 cleans which equates to 40 minutes of usage time. For many of us, despite desiring a long battery life, our brushes sit on the stand, being recharged and so in reality it is not all that important. Some modes like Deep Clean last longer so will reduce the number of cleans or cleaning time available from the internally fixed battery. Thankfully the battery status icons are a little more helpful than on cheaper models like the Pro 1000 and the three bars that illuminate blue give more indication as to just how much power is in the brush. So whilst not wholly accurate you get a better idea. Because the brush pairs with the smartphone and delivers a lot of digital data, it would be good if the battery information was provided with a precise percentage (%) as part of this. Sadly it is not. When power is really low a red charge indicator light begins flashing. If it gets this low you will normally hear and feel the speed of the brush decreasing and it will eventually turn off if all charge is used. At any point the battery icons are illuminated during and post use of the brush, but do go out after about 15 seconds. When docked and charging it can take 40 minutes of charging time to gain enough power for a 2 minute clean. If you want to charge the brush fully it can take up to 24 hours! 24 hours no doubt seems like a long time to charge a brush, but the way it charges is slower and everything is safe and this is quite normal. It is safe to leave the brush on the charger all day long without overcharging the battery. It is a shame that Oral-B have yet to employ an automatic switch off at the end of a cleaning cycle like Philips offer. I am sure for some this would allow the battery power to be maximised a little more. With a suggested retail price of $130-160 the Pro 5000 is a more expensive brush. The good news is though, that the actual selling price is around $100 or less, giving somewhere between a $30-60 saving – we have included a live comparison of buying options here. As is the case with any brush you need to factor in the cost of replacement brush heads, which typically work out at about $5 each. Brush heads can be purchased in packs of varying sizes. Often buying more makes the price cheaper. The exact cost will depend on which brush head you want and where to buy them from. The typical working life of an electric toothbrush is 3-5 years, so to give a gauge to the price of a brush and how it compares to others, here at Electric Teeth we calculate roughly what it costs to own over a 3 year time frame. Using the average cost (based on one user) and ownership over 3 years the SmartSeries 5000 will cost $155 or $0.14 cents per day to own. If you share the brush handle (not the heads) with other family members then the cost comes down quite considerably. We try the brushes we review here at Electric Teeth and as best as possible we aim to give you realistic expectations about the good and bad parts to a toothbrush and what ma or may not fail. Specialist equipment we do not have, we test it like you might at home, but do so with extra knowledge and experience from all the different brushes we have used and handled. Oral-B tend to make very reliable brushes. Most will serve you for 3-5 years trouble free and there is nothing that causes any significant cause for concern with the Pro 5000. The only consideration for some is that the 5000 uses a Nickel Metal Hydride (NiMH) battery which today is an older technology, compared to the more popular Lithium-Ion batteries that are available. NiMH have a tendency over time to degrade, but should this happen to you there is the 2 year warranty that has you covered. To prolong the life of any brush do try to discharge the battery fully every couple of months and give it a rinse and a wipe down to remove grime that builds up. As consumers we have choice. Never has the number of choices been so great within the electric toothbrush market and I would be lying if it I said it was easy to decide between brushes. The Pro 5000 is a solid electric toothbrush, there is no denying this. It offers a fantastic clean, a reasonable box contents, Bluetooth connectivity and 10 days of battery life. Purchasing the 5000 is far from a bad decision, but recent product revisions means that the Pro 6000 is a much better choice for most. Is the Pro 5000 an oscillating brush? A mode engineered to offer a polishing effect on the teeth as if you were at the dentist. Suitable for occasional or everyday use it works ideally with a Pro White/3D White brush head to make teeth look whiter and shine. Deep clean is an extended version of the daily clean mode. Instead of 30 second intervals with deep clean these are extended to 45 seconds which makes for a cleaning time of 3 minutes in total. No, the Pro 5000 has all the possible cleaning modes available from Oral-B. With the Pro 5000 you get just 1 brush head included, that is the FlossAction here. You can change the head with any others on offer from Oral-B. There are many that work with the brush handle. There are 6 main brush head options that include Cross Action, Floss Action, Pro White/3D White, Sensitive, Precision Clean and Deep Sweep. Does the Pro 5000 have Bluetooth? Yes, it does have Bluetooth connectivity. Does the Pro 5000 come with a warranty & how long is it? If purchased new from an approved retailer the Pro 5000 will come with a 2 year warranty. Does the Pro 5000 have a built in timer? Yes. Often referred to as the quadpacer; subject to the cleaning mode the brush will provide an audible warning through a slight pause in the brushing mode to tell you to change quadrants. There are 4 quadrants to the mouth, and brushing is normally for 2 minutes. The timer will active at 30 second intervals, with a different sound at the end of the 2 minutes. There is a visual timer in the form of the Smart Wireless Guide and the pressure sensor will flash green when a quadrant is complete and at the end of the brushing session. The battery lasts up to 40 minutes, which if used on the standard daily clean mode is 10 days based on 2 cleans per day. No, the Pro 5000 does not have a wireless smart guide included. Yes, a charging station is included with the Pro 5000. The Pro 5000 charging station or brush head holder has not been designed to be fixed to a wall. Do you own or have you used the Oral-B Pro 5000? Can you purchase just the charging station? Yes you can. You can buy it here direct from Braun/Oral-B.